Playing an acoustic guitar can be a true art form. To make the guitar sing takes real talent. Making acoustic guitars, however, takes a real artist. Few hobbies combine woodworking skills, a keen ear and patience in the same way making acoustic guitars does. While the process of making an acoustic guitar can be quite the challenge, the result is rewarding. Select the type of wood for the acoustic guitar. The wood should be a lightweight yet durable wood that is only about a quarter-inch thick. Spruce and cedar are two commonly used woods that are fairly easy to find. Three sheets, 36 inches by 24 inches, will be enough for this project. Create the front and back of the acoustic guitar. On two sheets of wood, trace the desired body shape in pencil. Cut the shape out of the wood with a bandsaw or jigsaw. Ensure that these pieces are the same shape and size when finished. Try clamping the two sheets of wood together and running them through the saw at the same time to accomplish this task. Cut a round sound hole near the center in the front body piece. The larger the sound hole on an acoustic guitar, the more treble the sound; the smaller the hole, the more bass. Consider using a large, round drill attachment for the task. Work on the sides of the acoustic guitar. Cut two pieces of wood long enough to wrap halfway around the outside of the body pieces by 5 inches wide. Immerse one piece of wood in boiling hot water for 15 seconds. Begin shaping the wood by hand to fit the body shape. This step may be repeated several times per side to get the desired result. Work quickly and remain patient. Connect the two sides using blocks of a strong wood and wood glue. Glue the sides of the acoustic guitar to the blocks of wood, one on top and one on the bottom, with the blocks in the area that will be contained inside the guitar. The appearance of these attaching blocks is not important, but they should fit tightly within the dimensions of the guitar. Clamp the glued sides to the blocks of wood and let dry. Brace the front of the guitar and inside once the glue has dried. Do some research to determine where and how each brace should be placed, as different placements result in different sound qualities. Line the top and bottom of the sides to provide a gluing point for the body pieces of the acoustic guitar. To do this, place many small notches in a long, thin piece of light wood. This will make the wood very flexible. Glue this flexible piece of wood all around the side pieces at the very top and bottom of the side pieces with a strong wood glue. Allow time to dry. 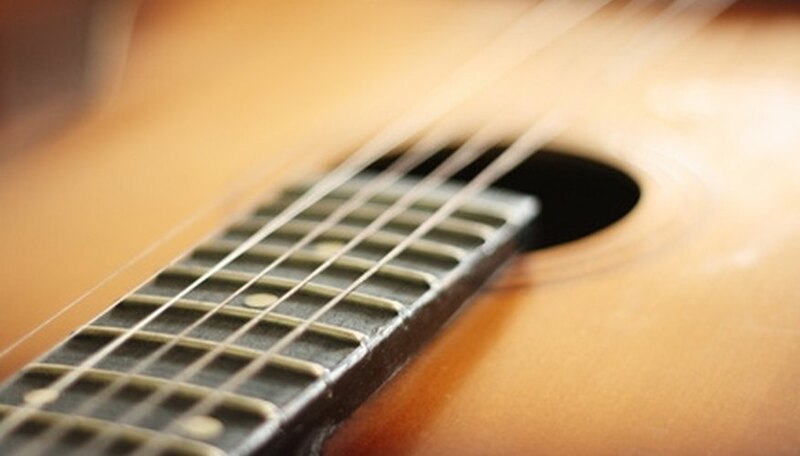 Use a strong wood glue to glue the top and bottom pieces to the side of the acoustic guitar. Allow time to dry and lightly sand the entire surface. The body of the acoustic guitar is now assembled. Coat the acoustic guitar body with any lacquer or stain desired. Read the specific staining directions provided by the stain manufacturer to achieve the best results. Use a premade neck and bridge combination for accuracy. Specific instructions will come with the premade neck and bridge pieces to suit the specific neck and bridge designs. Most premade necks will require you to carve a small groove. Measure twice and cut a groove in the front of the body to fit the groove of the neck. This can be done easily with a routing tool. Center the neck perfectly before attaching. Once centered, attach the neck to the body of the guitar using wood glue and a clamp to hold it in place while drying. The bridge attaches with small screws and glue about an inch below the sound hole. Add strings and get to strumming. Examine a professionally made guitar very closely for ideas on how to improve your craft. The entire process can take a few weeks to allow for drying times. To eliminate the guesswork, purchase a template to trace every piece to the right shape. Add purchased inlays to the body of the acoustic guitar before staining for a professional look. Wear leather gloves while shaping hot materials to avoid burns. Work in a well-ventilated area.